Image: Image Comics. Art by Jen Bartel. 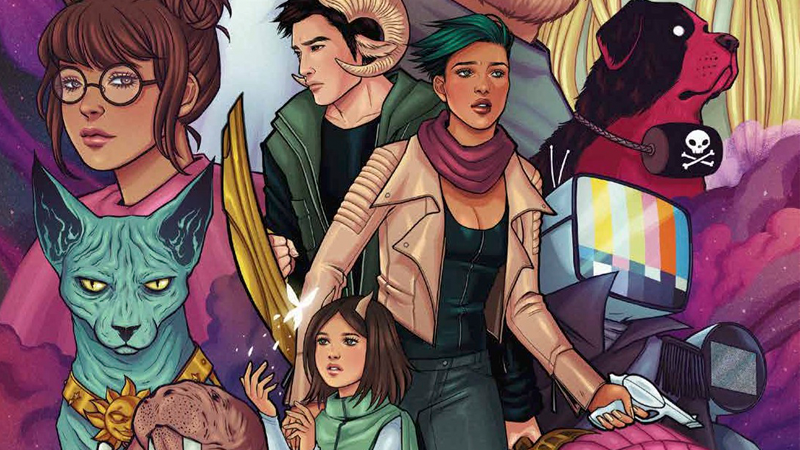 More Saga in any form is a good thing in our books, and the upcoming second volume of Brian K. Vaughan and Fiona Staples’ seminal comic series, due out next week, is no exception. To celebrate, we’ve got an exclusive look at some of the beautiful art created for the new collection, by some of the best artists in comics. Saga: Book Two collects issues 19 to 36 of the scifi epic, covering Marko and Alana’s quest to rescue their daughter Hazel after she’s captured and put in a prison on Alana’s homeworld of Landfall. It’s a far reaching segment of the ongoing story that includes some of the most emotional moments of the whole series so far—but as well as all that goodness, the Book Two collection will also come with a series of pinup art pieces and accompanying brief interviews with the artists (who range from the likes of Cliff Chiang, to Faith Erin Hicks, Jason Latour, and many more) conducted by Staples and Vaughan themselves. Check out Jen Bartel’s fantastic poster below, making its debut here on io9, as well as her brief interview with Fiona Staples from the new collection. Saga: Book Two will be available in comic book stores next week on April 26, and in bookstores from May 2, for $50.